The Benetton Formula One team began competing in the top tier of world motorsport in 1986. The team was founded by the Benetton family, owners of the Benetton fashion brand, when they purchased the Toleman team at the end of 1985. In 1991, they hired a young driver named Michael Schumacher who took the team to the pinnacle. Michael won his first two drivers championships with Benetton before departing for Ferrari. This car won four races with Michael en route to the season driver’s title. 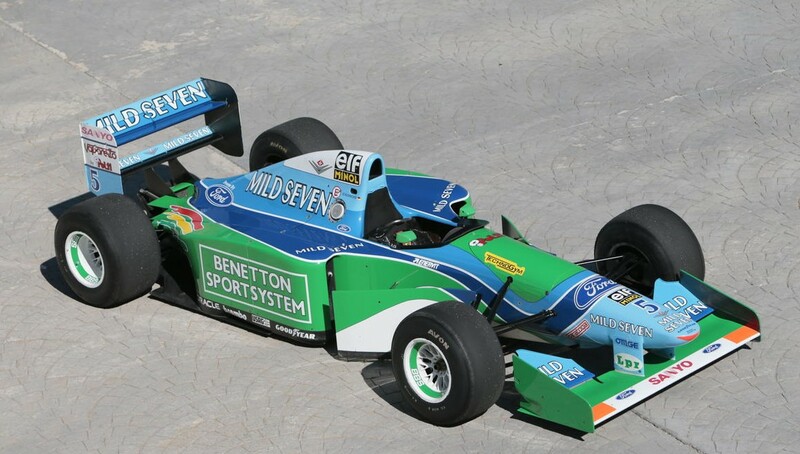 Benetton became Renault F1 for 2002 and Renault sold off many of the Benetton team cars that had been left behind. This one found its current home in 2008. A restoration was completed in 2010 and features the original 1994 Mild Seven livery. This is one important race car and it comes with a host of spares. No estimate is available, which is auction house code for “a lot.” You can read more here and check our more from Bonhams in London here. This entry was posted in Uncategorized and tagged 1994, auctions, b194, benetton, Bonhams, cars, cosworth, f1, ford, formula 1, formula one, race cars by classiccarweekly. Bookmark the permalink.